Retainer (squire rank) - "two years experience in the field under Sir Anvor (Deceased NPC)"
Welcome, your order is not trusted by anyone at the moment, but other then that have fun! And velkommen Tonedyr, made it eh? Yeah I was just kidding, everyone here is really great. Don't let the evil bullies of the jealous orders scare you.. they just fear our superiority. Well, of course I must support my lord in politics as in battle, should some knight see fit to take me as squire for the remainder of my training. If this leads to distrust, then so be it. I have all faith that in due time, the Order of the Griffon will make peace with our enemies... or crush them into the dust. Yes, it's nice to be welcomed like this, and I hope to involve myself with the community without undue OOC conflict. IC conflict, including significant losses and perhaps even my eventual death, is only to be expected - not much story without conflict. And the controversy will eventually die down, don't worry. When I joined Aranor was on trial and my order (Dawn) was in a similar position. Now everything is running smoothly once again. Yeah, we taken a bit of a beating recently when a number of things came to a head but things are settling down again thankfully. I will give you the access rights to the Griffons when two GM's give you the acceptance nod on the application thread. 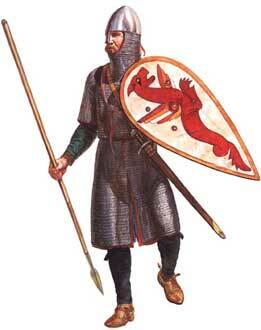 My one dream is to find a picture of a historically accurate Norman knight or a huscarl riding a dinosaur into battle. And there is the 2nd approval, welcome Tonedyr! I will abuse my GM privileges so hard for you if you get me a good one. Thankyou, it is an honour to serve under the Griffons. I suppose now is the time for a quest to find an avatar (It shouldn't be too difficult with the advice others have received, though a reduced photo of gauntlets on a book might be suitable too). Tubby, Couldn't find one riding a dinosaur but I though these was pretty cool. Those look like eastern normans, and a bit later period than I'm looking for. 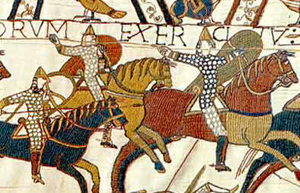 I'm talking about actual Normandy-Normans from the expansionary period. Tubby knows too much of this. The second one Mordred posted, is that what your looking for? Both of them are pretty accurate. I dont know much about that part of history so I will have to take your word for the accuracy part.